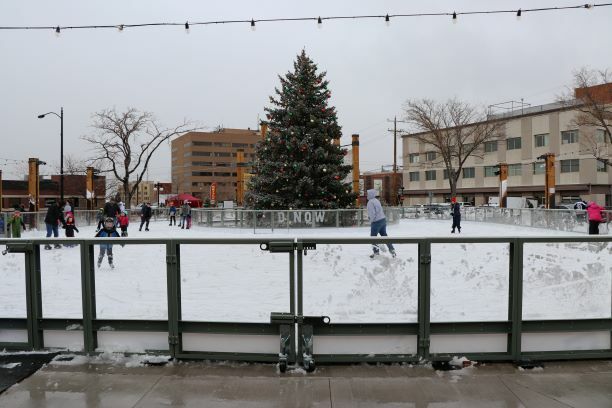 The ice skating rink opened for the season last weekend and the tree lighting ceremony lit up David Street Station. While that alone would be enough to spread holiday cheer, we’re not stopping there. We have packed the month of December with so many fun events that you won’t want to miss any of them! Our Winter Series events kicked off on November 30th with a full weekend of events. The Winter Series includes Cinema and Skate and happens on every Friday evening all month long. Nothing beats seeing your favorite Christmas films like Polar Express, Elf, The Grinch, and Christmas Vacation. To make your viewing experience even better, we decided to show the films while you ice skate and warm up by the fire. Check the events calendar for dates and details of each Cinema and Skate (we even threw in an ugly sweater party on the 7th!). Then, beginning January 2, 2019, Casper’s first outdoor Broomball League starts. On Wednesday evenings, teams of four to eight will compete against each other in a game of broomball. No skates or hockey equipment are required, this game is played in tennis shoes with brooms. You and your team won’t want to miss this opportunity to show us what you’ve got and register today! To learn more, join us on December 12th at 6 p.m. for the Broomball Social. We will fill you in on all things broomball and even give you a chance to try it out yourself! Skate with Santa events are happening twice throughout the month. Generously sponsored by Habitat for Humanity, Jonah Bank, and Artisan Alley, this event will give children of all ages the chance to get their last Christmas wishes to Santa before the big day. Photo opportunities and skating with the big guy will happen from 1 to-4 p.m. on December 1st and 15th. Finally, to end 2018 with a bang, we are bringing back the Noon Year’s Mac and Cheese Festival on December 31st. Be sure to sample all of the gourmet macaroni and cheese options from local Casper chefs. Then, countdown to noon by our Community Christmas Tree to ring in the New Year early with little ones that won’t make it to midnight. For ice rink hours, fees, and a holiday schedule, visit our homepage and scroll down through for the latest information and details. Spend the holidays with us as you create new memories and enjoy the spirit of the season at David Street Station, #WhereCasperComesTogether. No Replies to "Christmas Season Preview"